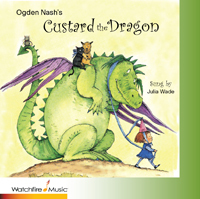 Ogden Nash’s delightful classic children’s poem, Custard The Dragon, has been most cleverly set to music by NY composer, Brad Ross. It receives a smashing performance by vocalist, Julia Wade and is produced by Peter Link. With sparkling orchestration created by Carol Jay for full orchestra, this 7 minute romp through the amazing mind of humorist, Ogden Nash, is a delight for children of all ages and adults who still hold on to the child within.